It's fair to say that if you're not social listening out for conversations about your brand, you're leaving yourself a little vulnerable to circling vultures ready to grab your business. This example popped into my LinkedIn newsfeed this evening and was just too good not to share. It just goes to show that if you aren't listening to your customers as a brand or social seller, then you leave yourself open to your competition who are listening. It's quite a reasonable question to ask. Clearly, the service isn't meeting customer expectations and they're sourcing alternative options. Kindly, the chap tagged Perkbox giving them a head start to fix the issue. Perkbox quite rightly responded...after eight other people had left their comments. That was enough time (we're talking hours) for 2 alternative solutions to be recommended. It's not just your competitors that will be watching. If you've engaged your tribes well enough, you'll have your customers, employees and partners getting involved in the conversation. Where tribal influence really comes into play is when others in the conversation stream start endorsing those recommendations. For me, that's true tribal impact. In this example, Peter Raith clearly has an active fan base. Now, I don't know Peter but he clearly has a delighted network ready to endorse and recommend his services. How powerful is that? It would certainly make me take a closer look. 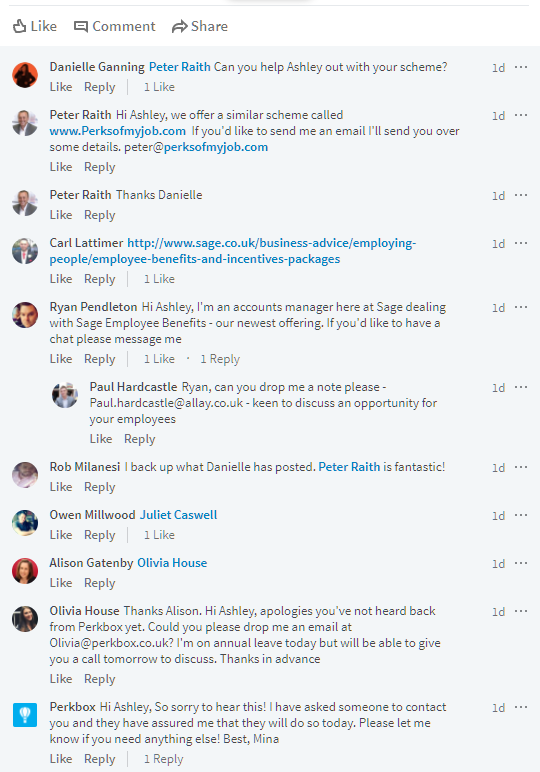 The conversation moved quickly and a further 10 employee/customer benefit suppliers have been added to the comment stream. I'm sure it won't stop there. So, not only have Perkbox got to win back the trust of this particular customer, they now have to fend off the vultures that are circling above. This example is an amazing Social Business mix of social listening, social advocacy, endorsements, social selling and community management. All there, in that one example. First and foremost, focus on delighting your customer. When your customer is delighted, they'll become your ambassador. Ambassadors recommend, defend and endorse you even when you're not there. If you're not listening on social media, know that your competitors are. LinkedIn is a great source of recommendations...if you ask! I'm going to finish with a quote that Gethin Nadin left in the stream. Sums it up perfectly!